Self Help Graphics & Art (SHG) has organized one of the most popular Día de los Muertos events in Los Angeles and perhaps the oldest Day of the Dead commemoration in the country for over four decades. Self Help Graphics & Art is unique in that it provides the community with a season of activities from August to November, to celebrate and prepare for Día de los Muertos. The season of activities includes the participation of over 50 community organizations, 150 plus volunteers and over 15,000 attendees. SHG’s Día de los Muertos season begins with Community Arts Workshops, held every Saturday in October at which participants and families create traditional crafts to honor the dead. It also features the production of a commemorative limited edition fine art serigraph (print) to be premiered at the annual exhibition. Furthermore, over 40 community partners participate in the creation of 40 plus altars including Self Help’s Community Altar that is built during Noche de Ofrenda (Community Altar Night). Not only is Noche de Ofrenda a chance to remember and honor those who have passed, it is also a way to bring the community together in remembrance. The season culminates at SHG’s Annual Día de los Muertos Celebration held on or near November 4th. The celebration includes a procession and blessing along with art, craft vendors, music, food and workshops for the community. Throughout its history, Self Help Graphics & Art has worked with well-known artists including but not limited to Yolanda Gonzalez; Wayne Healy; Miguel Angel Reyes; Ester Hernandez; Carlos Almaraz; Eduardo Oropeza; ASCO members- -Harry Gamboa, Gronk, Willie Herron and Patssi Valdez; Judy Baca; Chaz Bojorquez; Los Four; and the East Los Streetscapers. Every Saturday in October, Self Help Graphics offers the following Dia de los Muertos Community Art Workshops. All materials and teachers are provided by Self Help Graphics & Art! Please be on time, wear clothes that are not too precious, enjoy a Saturday afternoon of fun & tradición with new friends and old ones too. Free for the entire familia! Information on specific workshops is forthcoming. Every year Self Help Graphics selects an artist to create a limited edition serigraph to commemorate the year’s Dia de los Muertos Celebration and to curate a group exhibition based on that year’s theme. 2018’s commemorative print will be created by Artist in Residence Dewey Tafoya. The title of the exhibition is “How We Remember and How We Survive”. The artists in the exhibition include Michael Alvarez, Nani Chacon, Ofelia Esparza, Jennifer Gutierrez-Morgan, Nery Gabriel Lemus, , Dalila Paola Mendez, Ami Montevalli, Noni Olabisi, Cruz Ortiz, Zeke Peña, Jose Sotelo and Miyo Stevens-Gandara. The exhibition will be on view at SHG through December 8, 2018. 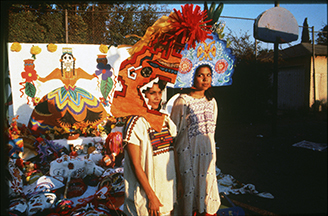 On November 2, participants, many of whom paint their faces as Calaveras take part in a public procession where life size calaveras, personal and family items are carried and offered to the deceased family members at a large Community Altar. The procession and traditional blessing kicks off a festive celebration with arts, craft and food vendors, musical performances, face painting, and children’s art workshops. Over 10,000 guests enjoy a community gathering that celebrates community, life and death. A day of art workshops concludes with the construction of a large community altar at Self Help Graphics & Art’s Noche de Ofrenda at Grand Park. Over the past three years SHG has partnered with Grand Park to expand the reach of this beautiful community altar night with over 40 plus organizations, partners and artists installing altars of all kinds. Led by premier altar-maker and community resident, Ofelia Esparza, participants are invited to place their newly created offerings or those brought from home together in creating a community altar for display throughout our Dia de los Muertos festivities. This inspirational and important art of traditional altar making serves as a way for the community to contribute their memories with special tokens of remembrance. Poetry readings, Pan de Muerto and Xocolatl will also be a part of this special evening.